I was, at first, reluctant to order this DVD. I did not think I could buy another video that would have so much life changing information then PTTP or ETK had. 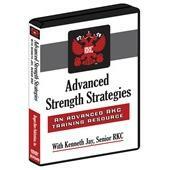 I fiqured I had nothing more to learn from the RKC's, I was wrong. 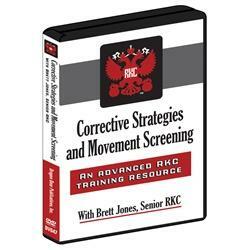 How sure are we that Corrective Strategies and Movement Screening (DVD) will work for you? 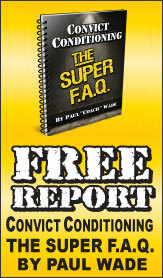 Simply fill out the form below and put Corrective Strategies and Movement Screening (DVD) to work for you right now. Obviously, we would go out of business if Corrective Strategies and Movement Screening (DVD) didn't work, the way we said, right? With the promise of a full refund if you're unsatisfied, you have nothing to lose by trying Corrective Strategies and Movement Screening (DVD). Go ahead and try it today. In YOUR Life, Do You Want to Be a BENCHWARMER — or a PLAYER, a DIFFERENCE-MAKER? This high school basketball star could only manage to squat and toe touch as shown—he declined to fix his imbalances and suffered career-ending injuries as a result in his senior year. What are we all REAL GOOD at—and what do elite athletes EXCEL at? Compensating for a flaw, deficiency, or imbalance in the body. Option A is not available—our body jumps to Plan B. But plan B comes at a hidden price. In fact, the better you are at switching to Plan B the more surely you will be injured. Guaranteed, your durability will be a joke. The athlete in the photos above is not faking. This is a high school junior several years ago who was leading his team, killing it on the court. He was a countywide superstar. Everybody was afraid of this kid on the court. But this is what he looked like off the court. That was his toe touch. That was his squat. What do you think was going on with this kid? When he moved the way you know he must have moved on the court? Micro trauma every place. Guess what? He got injured his senior year. Missed his window. Didn't get a scholarship. Non-contact injury. Wouldn't do the work. Didn't fix it. Yes, micro trauma. A series of minor stresses to the body resulting in limited area tissue damage or tears each of which alone does not cause discernable damage. However, their accumulation over time can lead to a significant injury. 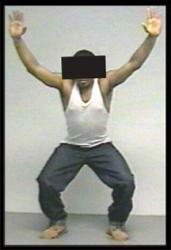 Inefficient movements cause compensations, which move a joint in an unnatural manner. The body will always sacrifice quality for quantity. Movement patterns will follow the path of least resistance. When you stack these compensations on top of each other, screening for movement becomes essential. How do we assess movement? Well, we break it down into these seven basic movement and stability programs. We squat. We step. We lunge. We reach. We leg raise. We push-up. And we look at rotary stability. What the movement screen does is put people into categories and rank them. You can't actually fix anything until you rank it and identify it. When we find out you can't toe touch and that also matches up with the fact that you can't deep squat and you also have a bad active straight leg raise, we can place you in a category that allows us to then evaluate what's going on and create a corrective strategy to address that. Well, if the World Champion Indianapolis Colts insisted their players be screened before being cleared to play, we figured our Level 11 RKCs deserved training in this same cutting-edge process. What you get here is every critical minute of the seminar Brett Jones delivered on this protocol to our Level II RKC candidates in June 2007. Brett's information was so impressive—and the results so spectacular that by popular demand, we are releasing the complete training on this 2-DVD set. What is a Corrective Strategy? The information on this video should be required watching by anyone who even thinks of training with weights, or before anyone can buy any of Pavel's videos. I think this video would save a lot of people some grief and pain. The tests and the resulting remedies are well thought out and presented very well. Production value was excellent and Brett spoke clear and professional. This kind of information is well worth the price. Brett Jones and Dragondoor deserve a round of applause for this new video. You all need to take a bow. Thank you for another video that will help me take a quantum leap in my training. For all out there, get this one! For me I was so impressed, I am going back to buy Kenneth Jay's video. I have renewed faith. This information has made an immediate impact on myself, and the athletes that I train. I've been at this stuff for a quarter of a century and like to consider myself fairly well informed on how to help someone become stronger and more mobile. Well, once again Brett proves that he's on a whole other level. The things I learned about my own body's compensations kick started my training with gains that I hadn't seen in years. More importantly, it made an immediate impact on my students. I'm talking about the kind of impact that has made coaches and parents comment about the dramatic improvement in on field performance. These are comments made about kids that were already some of the best player on the field, and these improvements showed up across the board in just 2 weeks. If you train others, you owe it to them to get this DVD. Rated 9/10 Brett Jones is a Remarkable Speaker and trainer. I found the dvd to be very well presented, very informative, engaging and clearly explained for all to understand. It's an area that I kinda shyed away from but after getting this dvd I have bought the books recommended in the dvd to use along side it. For me the gold is in the second dvd. Both movements and corrective exercises are very clearly explained and demonstrated to have a profound effect. I look forward to beginning the process of improving my movement patterns and eradicating all the niggling injuries I have accumulated. 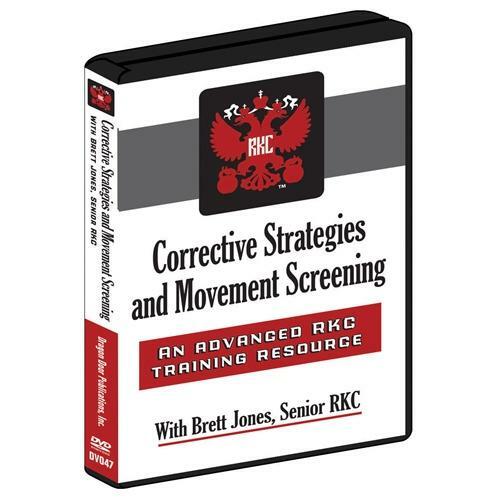 Rated 9/10 An awesome, clinically-applicable movement screening DVD package! I bought this DVD because I have used the deep squat, toe touch, and straight leg raise to assess the functional movement patterns of my patients and wanted to see what Mr. Jones had to offer. He and Gray have done a great job in presenting a fairly complete and comprehensive functional movement screen that, for the most par, can be used on the general public too. I would have given it a 10 but some of the questions are hard to hear, it doesn't seem like Brett workshops all 7 movement patterns in regards to improving them by giving the "patient" simple tasks which allow for neuromuscular changes, and I really feel like both Mr. Jones and Mr. Cook have more up their sleeves with regards to the corrective strategies that they didn't show.....oh well, I'll buy more DVDs to get this info because like I wrote, thisi is clinically applicable. I watched these DVDs and Stuart McGills assessment and treatment DVDs and the next day, I was able to integrate some of the techniques into my practice to elicit change in a couple of patients movement patterns. As a sports Chiropractor I found this DVD exceptional. In a straight forward way the functional movement patterns and corrections were easily demonstrated. This is a must for any people dealing with athletes, as well as the general public. This DVD set is an excellent adjunct to any of the Gray Cook FMS DVD's. The tips given are helpful in refining the FMS process and the corrections given are simple yet effective. I highly recommend this DVD set for those that use the FMS to evaluate movement. Brett is a very clear speaker who brings both the research and the "trenches" to his presentation. Great job Brett!! This DVD has handed me those missing pieces of the Hard Style puzzle. It turned out that my glutes weren't firing like they should and that my left ankle was immobile. In just a few days I've made a huge difference correcting them and it sure pays off! I can squat much more upright (enhanced glute activation), can swing without lower back soreness (and of course still improving) and can deep squat perfectly now (narrow stance overhead squat with a stick). I'm looking forward to applying this basic screen together with the simple corrections to other people. Make sure you watch the bonus material with Pavel. This isn't included in the "play all" list. This is a tremendous DVD with Brett Jones. He s a very smart guy, leading through this course. Not only theory but the practical part has a lot of information to help you to correct your imbalances. Fantastic video with priceless information. Worth every penny and most importantly it definitely works with any client!!! Brett does a phenomenal job explaining each test and presenting corrective strategies that cause speechless results!!!!! Thanks Brett your the best!!!! This is a great collection in the RKC II Library. As an HKC instructor this will greatly assist me in finding out my clients issues and learn how to correct them. I'm looking forward to the last DVD to see how it's all put togehter.